Inculcating a fit, balanced and healthy lifestyle from young has always been part of the R.E.A.L Schools curriculum and practice. Yearly events such as sports carnivals and telematches are integral towards achieving this aim. 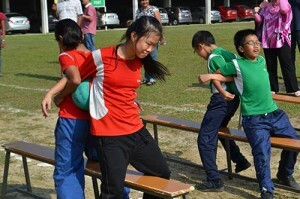 On 11 March this year, R.E.A.L Schools National, Shah Alam Campus organized its annual ‘Junior Telematch’ which involved a total of 350 Junior 1 to 6 students and 35 teachers, who gathered at the campus’ school field in anticipation of a fun-filled morning. The programme commenced with a welcome speech by Mr. Selvam Perumal, Senior Principal of R.E.A.L Schools National, Shah Alam Campus, who also officially opened the event. Students from the four competing sports houses; Red, Blue, Green and Yellow, proudly displayed their respective team colours and flags in a march past that undoubtedly lifted spirits and morale for what was to come. 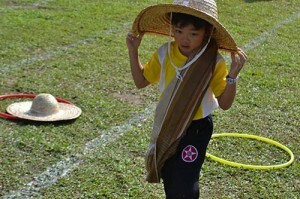 Following a traditional oath-taking by the students, the main event kicked off with a host of exciting games and activities. In typical telematch fashion, the games had surprisingly quirky elements in them, but these simply added to the entertaining nature of the whole event. With hoops, costumes, buckets, balls, hockey sticks and even cooking utensils being used; both students and teachers had a whale of a time with loads of cheers and laughter ringing all around. Despite the fun and friendly atmosphere, the telematch was still a competition. Participants had to put themselves to the test in terms of speed, balance, coordination and most of all, teamwork, in order to successfully complete the various challenges and clinch the medals up for grabs. Despite the hot weather, students, teachers and parents alike were seen enthusiastically encouraging and cheering the children on. In the end however, it was all in the name of good fun, fair play and sportsmanship. All in all, this year’s Junior Telematch had thoroughly fulfilled its objective, which was to raise the self-esteem and confidence of young people by engaging them in fun and exciting sporting activities that help to develop lifelong values and promote wholesome outdoor fun. The post Telematch Thrills and Spills for Cahaya Juniors appeared first on best international schools in malaysia.